So tonight I saw Train in concert. Michael Franti and the Spearheads, one of their opening acts, brought a couple up on stage and the man proposed to his pregnant girlfriend. This was the second concert where I witnessed a proposal. Ironically, the last was at another Train concert during their performance of "Marry Me". How apropos. Excitement filled the arena; however, I just couldn't get there. The gesture was sweet and awe-inspiring - a sign that romance is not dead. But my chest sank a bit while my mind wondered, "will it ever happen for me?" Suddenly I remembered feeling this way at another point in my life - during my pre-teen years when all of my friends started developing. The answer to that question is the same now as it was then...a solid yes! Sometimes when we're single it seems like the rest of the world is in "plus one" paradise. Hand holding, back pocket grabbing and other *PDA's become our enemies because it reminds of companionship we once had (or hope to have). Usually this is where my internal guilt alarm turns on (due to all those years of Catholic school I'm sure). I really want to be happy for those other people, I do. But my heart longs a little more than usual to find that special someone. Pop quiz. Name this movie: "I've been dating since I was fifteen. I'm exhausted. Where is he?" 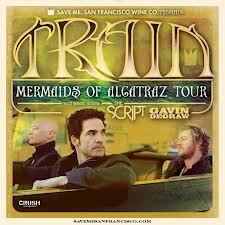 Tagged with Mermaids of Alcatraz, Train, proposal at concert, Michael Franti and the Spearheads. July 14, 2013 by Veronica Dasher.